So I was creating this rhino and when I wanted to use the mirror modifier on it, however you could see a large gap between the two parts. 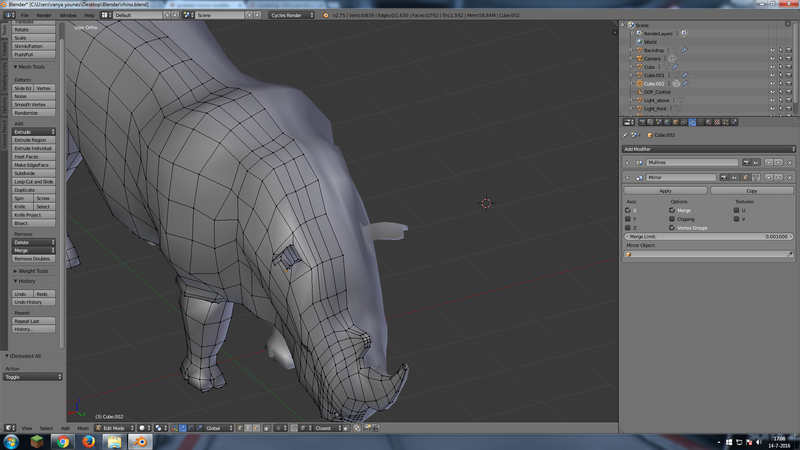 In edit mode the vertices are merged together but in object mode there is a gap. The Multires Modifier has to be the first one in the stack, you cannot move it anywhere else. That's why Blender always first evaluates MultiRes, then the Mirror. The trap you're falling into here is that with the Multires you very likely deformed vertices in the center line, which moves them away from the symmetry plane, and thus the Mirror doesn't merge them any more. A usual way to avoid this is to apply the Mirror before you even add the Multires to the mesh, and sculpt the mesh using X-Mirror, so all sculpting happens on both sides of the model. However there might be a quick fix: Try increasing the Merge Limit until the center line merges again, and then check the rest of the model if vertices accidentally merge there as well. If you're lucky, the deformation has not been too destructive yet. Not the answer you're looking for? Browse other questions tagged mesh modifiers editing mirror sculpting or ask your own question.